Everyone who travels with their RV has a style of travel planning. From planned out to the last detail to winging it, people have their own way. While RV travel planning can be stressful in some ways, it needs to happen even on a minimalist level. Leaving a campsite and driving with no plan on where to stop next is a recipe for disaster. So many factors lend themselves to avoidable mistakes & disappointments if you have somewhat of a plan in place. If you drive until you are tired and then look for a campground – you might be out of luck! Depending on your route, you might not be anywhere close to a campground or even place to safely boondock. Even if you like to boondock, planning ahead to arrive in a place you can do that legally and safely should be done. Even if you know there are campgrounds and RV parks along your chosen route, depending on the season, there may not be one available. During the main RV season (May – October) many RV groups and events happen and take up a lot of space in campgrounds and RV parks. Not to mention the high quantity of RVers on the road. Calling ahead and making a reservation can save you from disappointment or worse yet struggling to find a place to stop when you are already tired and wanting to stop. While trying to get back ‘home’ (where our kids are) for a visit for a month. Even three months out, we struggled to get a monthly spot at our favorite RV park. We had to call around and find a place that is not a convenient location to camp. Not planning ahead caused an avoidable mistake for us! So, if you do plan ahead, how do you keep track of your plans? We developed an RV travel planner that helps with these RV travel planning obstacles. 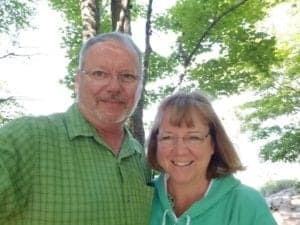 We found ourselves calling campgrounds, getting rates and then turning around and calling them back to find out more answers to questions we had. Get our free Campground Reservation Log at the link below to keep track of your campground reservations. This will help you cover all your questions for the campground when you call with one phone call and make it an easy reference for your travel planning. Once we started using that, we felt we need something more comprehensive. 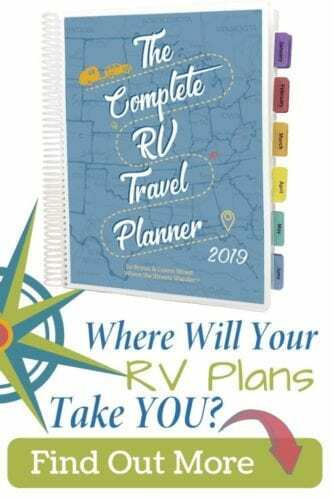 So as a solution to our own RV travel planning needs THE COMPLETE RV TRAVEL PLANNER was born! We wanted to keep track of where our reservations were. We wanted to plan our daily tasks and activities. We wanted a complete travel planning system for our RV life. Check it out and see if would help you in your RV travel planning. If you make a personal plan of average mileage you feel you can comfortably drive and not feel too tired to enjoy yourself, you are doing yourself a favor. Our personal average daily mileage is 300 miles. We prefer less than 200 but if we are driving to a destination that is farther away we set our limit to 300 in order to cover the mileage necessary to get there. Driving an RV, whether it’s a class A motorhome, 5th wheel or travel trailer, is hard work. Many mental aspects are involved driving for hours in something that is bigger than a car and also towing something long. So many variables to consider and can be mentally exhausting. This can lead to mistakes and avoidable accidents. We actually learned this the hard way before we became full-timers! We planned a trip to Prince Edward Island Canada. Totally RVing newbies, we planned 10 hour driving days. We wanted to get the most time possible on PEI so we wanted to get there! Not realizing how tired and slow RV travel feels and is, we (mostly Bryan – he was driving) felt exhausted every night and didn’t get to enjoy the process at all! As stated above, if you plan ahead, you can stop while you still have energy to set up camp, still have daylight, time to cook dinner and sit around a campfire. Enjoying this part of the RV lifestyle is as important as getting to see the things along the way and at your destination. Another RV travel planning mistake is not seeing everything you wanted to see when you traveled somewhere! That makes me crazy! I hear about great things all the time from other RVers about place to visit and things to do! Most often it’s not about where we currently are but in a state/place miles away. How can I remember when I get there? A unique feature in the planner is a place for you to write down those great recommendations by state so you won’t forget when you visit. Planning your daily activities when you are visiting a place is important if you don’t want to miss some great things! Sometimes destinations like Washington DC, Mackinac Island, MI, Orlando, FL all have many cool things to do! How do you sort it out and make sure you actually do what you want to? This article RV Traveling with a Focus will give you some ideas for figuring out your personal way of RVing. To help your travel planning download a FREE Campground Reservation Log in the post below. When you are in areas with many things you want to experience, planning out your days can help you make the most of your time there. 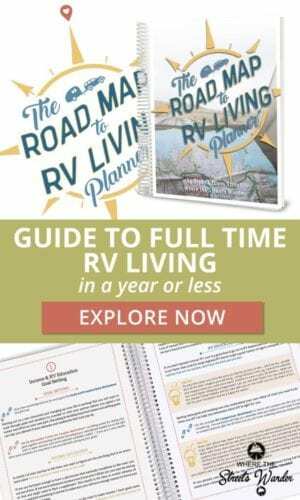 THE COMPLETE RV TRAVEL PLANNER has weekly and daily sections for you to write down what you need to do, what you want to do and where you are doing them! For more route planning and road trip tips check out this article and find some great resources for actual route planning and road trip ideas. Once you plan your route, record your campground reservations on this Campground Reservation Log or in your RV Travel Planner. Avoiding the travel planning mistakes above can make your using your RV for travel a pleasure. While it might be fun to fly by the seat of your pants, you can make the process more pleasurable by planning ahead (even if it’s minimally), keeping track of your reservations and fun things to do when you arrive. You will enjoy your travel more! Thanks Becky! We have made these mistakes and hope people can avoid them! I love this post.very down to earth suggestions! Keep up the great work!!! I used your reservation log last year on our cross country trip. What a time saving document it was–planning out our campsites got sooooo much easier with written info in front of me. No more double booking, etc. We carried the reservation log into the front desks– several campgrounds wanted to know where we got this as they thought it was such a good planning tool. Thanks, Becky, for making my life easier!!!! Patricia, thank you so much for the great feedback! It has definitely helped us in our journey! Good reminders. As we plan to visit other states I now do two primary things to figure out what we might like to see and do. I go on Wikipedia and look up museums for a state. I do a copy and paste into a document and organize by cities. I then go into Trip Advisor and look up those towns for more items. I always find other places that I would never have known about. Yes, it is time consuming but we will never have to say: “What is there to do in this area?” It also helps us determine good areas to camp as we mark on a paper map to see what is nearby.